Jack and Fay began their organic and natural food home delivery service 28 years ago to get delicious, healthy food to the people who love it. Their first two products were granola and peanut butter. Why? Because they love them both (and so do their staff!). According to Jack, his mother used to make the best granola in the world and just recently he came across her original typed recipe. He tried it out and found it as awesome as he done back in the 60’s. With all the new ingredients available to us he did a bit of tinkering and came up with his own less sweet version with no dairy or sugar. It is fresh and crisp and we’re giving out free samples from time to time in our Tengu orders so some lucky customers will be able to taste it for themselves. What we found most staggering was how easy it was to make a great tasting granola. 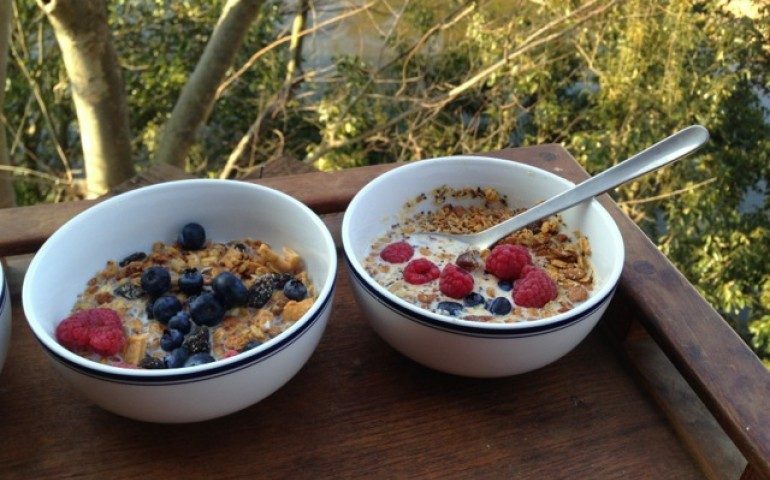 There are a million recipes you could follow online, but instead we challenge you to create your own style of granola. Here is a basic recipe for you to work from, and which is the basis for our own Alishan granola. 1 cup apple sauce / oil. Combine your ‘glue’; by this we mean your sweetener and apple sauce/oil blend. You might find it easier to blend over a low heat. Spread out in a thin layer on a large baking sheet and bake at 150℃ for 20-25 mins, stirring occasionally. You may also have to turn the baking sheet depending on how evenly the granola browns. When it’s a light golden brown it’s done. Add any fruit you fancy and you’re done! You can change the flavour with spices like cinnamon or nutmeg, you could add vanilla or almond extract, you could flavour with cocoa, add a pinch of salt, make it all coconut with flakes and shreds and oil, the choice is entirely yours. If you want to keep the price down use more oats, raisins and sunflower seeds and you could even add cornflakes or rice puffs to lighten the granola and lower the calorie count.